Won't You Join the Trance? Opera and cabaret? Aren’t those forms mutually exclusive? We expect opera to be performed in posh, decorative halls, the kind that cater to a certain upscale clientele. While cabaret is traditionally ad hoc, low rent, luring those with a taste for the demimonde. Yale Cabaret, of course, is not, strictly speaking, a cabaret in that sense. It’s a small-scale performance space which, this weekend, hosted performances of Gian Carlo Menotti’s “chamber opera” The Medium, directed by Anh Lê of the Yale School of Drama and featuring an eclectic cast drawn from YSD, the Yale School of Music, and elsewhere. Lê is adamant that opera needn’t be a blue-haired special, but is as vital as any form of theater, that it can get down and dirty, and can get its passion and power across even without full instrumentation. And Lê is right. With Menotti’s full score skillfully reduced by music director Jill Brunelle for her own solo piano, the Cab’s version of The Medium emphasized the strength of the acting. And the intimacy of the Cabaret is perfect for this particular opera, which presents the vicissitudes of fake medium Madame Flora (Janna Baty), who lords it over her winsome daughter Monica (Lynda A. H. Paul) and her factotum Toby (José Ramón Sabín Lestayo), a mute Gypsy boy she took in off the streets. We first meet Monica and Toby as they play dress-up, with Toby an imagined prince and Monica a princess. We feel the shabbiness of their dreams, even as the music lets us thrill to them. 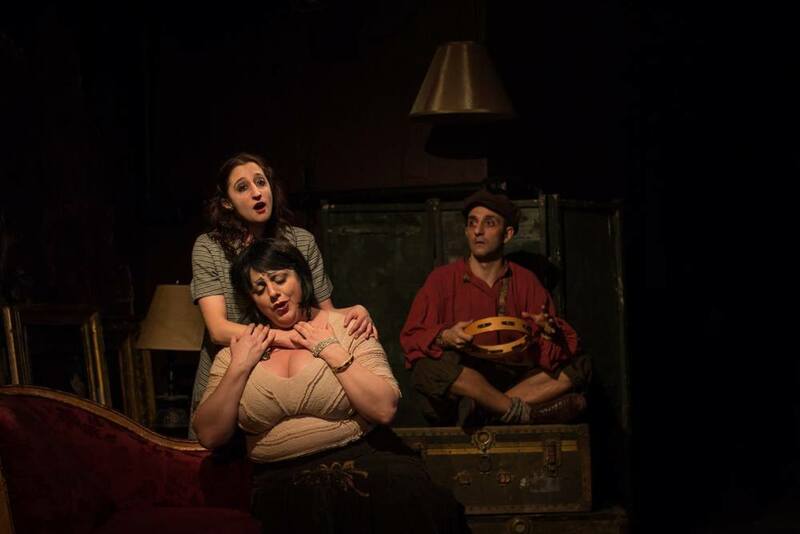 The strength of the story-telling is abetted by Adrian Martinez Frausto’s lovingly crafted set, full of a down-at-heels Old World charm that lets us know the streets are never too far away for this trio. The way to make money, for Madame Flora, is via a different kind of make-believe: she succors heartbroken parents of deceased children—or, to put it less kindly, she fleeces them. Two such are Mr. and Mrs. Gobineau (Sterling Liška and Kelly Hill), who fill us in on the nature of their bereavement by imparting their story to a newcomer, Mrs. Nolan (Rae Powell). The naturalness of the “dialogue” amongst this trio attests to Menotti’s command of setting straight-forward English to music. The score, with its full panoply of strings and woodwinds, would, I’m sure, give a much greater rhapsody to these plaintive tales of lost children, and yet much of the essential spirit comes through in Hill's sensitive vocal. Liška, particularly, is welcome as the only male voice in the piece, giving an extra gravitas to this most respectable couple who lost their son when he was only two, via a terrible accident. They come to Madame Flora so she can conjure up the little boy’s playful laugh, a sign that he is happy beyond the grave. The laugh, and the apparition of, supposedly, Mrs. Nolan’s sixteen-year-old daughter’s ghost are provided by Monica, and, indeed Monica is intrinsic to both Madame Flora’s “show” and Menotti’s. Paul sings most of the melody lines that remain with you after the show, including the haunting line—for Mrs. Nolan’s benefit—“Mother, Mother, are you there?” Later, high-spirits are worked off with a delightful segment in which she sings “Monica, Monica…” while dancing a waltz-time spin with Toby. But all is not well. Madame Flora, in the midst of her pretend trance, feels a hand go for her throat. Naturally, she blames Toby because she pretty much always blames Toby. But she’s uncertain and unnerved. The aria in which Flora sings of all the sad and awful things she’s seen, without blinking an eye, only to be undone by this phantasmal hand, is full of a musing pride and sorrow to which Baty does full justice. Elsewhere, Flora is less sympathetic as she manhandles Toby while the piano seems to work as a demonic goad. The solo instrument and the singers’ voices create a fascinating interplay throughout the evening, often manifesting a somber effect greatly aided by Andrew Griffin’s lighting design—which recreates period illumination—coupled with Frausto’s heavy drapes and distressed plaster, while Hayden Zelideth’s costumes, particularly the gypsy-like get-up Flora hangs out in and the gown she wears for séances, add to the overall illusion of genteel Bohemia. With Lestayo’s very expressive eyes seeming to see things we can’t (as Flora says), and the music expressing more than anyone says, there’s a sense in which “the medium” of art evokes the limits of imaginative rapport and the limits of human truth. When Flora tries to expose her tricks to get rid of her clients, they don’t believe her. Mr. Gobineau suggests she only thought she was tricking them but that the reality is more than she can know. Menotti, it seems, shares this view to some extent and that uncertainty works. If there’s more here than meets the eye, it’s because what fills our ears makes us susceptible to other flights of fancy. Like the inaudible voice of Toby that Monica claims is the most beautiful, the invisible hand—of guilt? of truth? of the dead?—may be the most powerful. Haunting, magical, and richly rewarding, The Medium establishes a new high standard for music and theater—in short, opera—at the Cab.